Magento extensions are pieces of coding which are created in order to either stretch the limits of the Magento platform or else to help with some already existing part of it. Extensions, since they cover many different areas of the platform, can therefore be used by sites hosted on Magento to increase sales. This can happen in a number of ways because it depends on what extension is being used. If the extension handles product display, then it can help to induce customers to buy the product. If the extension is something which makes creating accounts simpler or streamlines the ordering process, then it could bring customers in through that. Which extension is used depends on the retailer, and what they think is important. It is also dependent on the site, and how it works together – what works for one site may not work quite so well for another. This extension streamlines the checkout process by making it so that all the steps appear on the same page. Fewer pages to go through means a faster process, which will help to retain customers who might otherwise be put off by the length of the process. This extension makes use of SEO to ensure that what appears on search results run by any of the major search platforms is what the retailer wants to have there. The extensions itself works by showing the keywords which will bring up the site, allowing whoever runs it to tailor their SEO accordingly, whether that is to appear higher in search rankings or to avoid certain searches altogether. This extension allows for the creation of a loyalty which can be used to reward return customers, and also entice new customers in with the promise of loyalty rewards. The promise of rewards for purchases can bring more sales in the form of returns customers as well as new ones. This extension helps users to integrate their sites with various social media platforms, such as Facebook or Pinterest. This will help in a number of ways – social media is being used more frequently for reviews as time goes on, and also because it allows for a new market to be explored. This extension makes it easier for customers to leave reviews, something which will boost sales in the future through people doing research and finding the reviews. Moreover, the reviews themselves will bring more customers to the site. This extension will offer points to loyal customers, points which then build up to rewards for those who have a certain amount. The use of this extension will encourage customer loyalty and retention. This extension allows for bargaining and haggling over prices, rather than allowing everything to be a fixed price. Letting customers be involved in setting prices increases engagement and sales. Events Manager is an extension which allows for the online coordination of any event being held by the site in question – it allows for ticket sales, YouTube videos\marketing, and other forms of marketing to be released in conjunction with each other, smoothing the marketing process, and making it more likely that people will hear about the event and attend it. 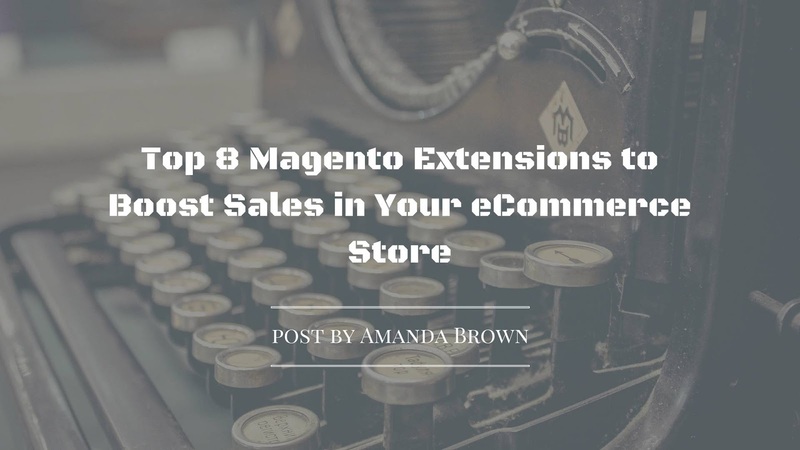 There are a number of different extensions which can help increase conversions and sales in Magento, including the ones mentioned above. The extensions can help to streamline processes such as checkout and reviewing, in both cases increasing the likelihood that customers will complete the process. Other extensions, such as the ones which govern loyalty programs, also encourage sales through the promise of rewards later. Amanda Brown is an eCommerce expert at WillbeCoded. She is fond of innovations and technologies. Amanda pays careful attention to the latest trends in eCommerce and online marketing to share it with her audience.